Don’t Get Left Behind… Be In The Know. Speed Secrets Weekly is delivered to your email inbox every Tuesday morning, in time for you to have recovered from the past driving weekend and with time to prepare for the next. No need to go to a website, Facebook, the newsstand; flip past endless pages of advertising; download another app; search various forums; and who knows what else. 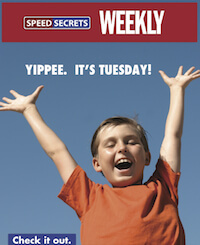 Speed Secrets Weekly does not provide the news – that’s what the internet and hardcopy magazines are for! But if you want to learn, if you want to be entertained, then Speed Secrets Weekly is for you. With famous and not-so-famous guest contributors, along with my weekly tips, advice, and stories, the reading is entertaining and educational. Get your weekly dose of education and entertainment delivered directly to your inbox. No fuss, no muss, just the info you want, when you want it.